Michio Kaku presents concepts familiar to both casual and hard-core sci-fi fans alike and discusses the possibility of them happening. Each concept fits into what he calls a Class I, Class II or Class III impossibility. Class I = Impossible today, but do not violate laws of physics. These could become possible within a few centuries. Class II= Impossible today and maybe not possible for thousands to millions of years. Class III= These could only be possible by re-writing current laws of physics. I don’t recall ever enjoying a book like this so much. His narrative includes explanations of how historical events shaped science and vice-versa. I really appreciate how he never really closes the door on the possibility of anything, perhaps recognizing how so much has changed scientifically within the last century. Rather, he explains what it would mean for any of these things to be realized. As an example, on the discussion of perpetual motion machines one might ask if they are possible. 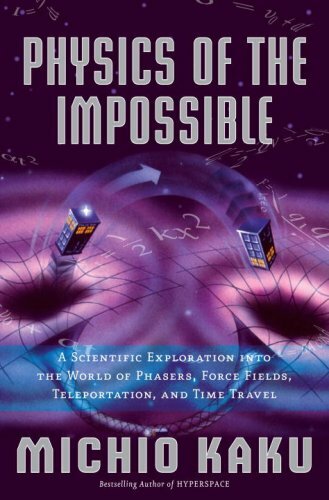 He classifies these as Class III impossibilities meaning for them to be realized would mean a large change to current understanding of physics. In short, the book sounds a bit geeky and probably is. Yet I think there is enough balance here to entertain the geek and non-geek alike. Chris Anderson has written a book that took an interesting idea and then beat the heck out of it. That said, there was enough incremental information over the original Wired article about the book to make it worth a read. I rather enjoyed the portion of the book devoted to the relatively recent historical events that shaped the tail the way we know it. It tied nicely to understanding the so-called ‘hybrid retailers’ which don’t actually have inventory but are more like retail aggregators. “Eating’s not a bad way to get to know a place,” according to Michael Pollan. This said after he created a meal entirely by hunting and gathering the food himself. Of the meals explored in this book, this surely seemed to please him the most. Most certainly, this statement referred to eating food local to the area, not just a local restaurant. The omnivore’s dilemma, as described by Pollan is essentially having the ability to eat a wide variety of foods presents the omnivore with the possibility of choosing wrong or deadly foods. From the primal fear of gathering an instantly deadly berry or mushroom in the forest to modern debates on what foods will kill us over a longer period of time, we are forced to think about what we eat. One of the more interesting premises in the book is that cultural eating habits are essentially ways that omnivores over time are able to create a safe cuisine based on location through trial and error. America, having no distinct cultural cuisine is especially susceptible to fad diets as a result. Aside from that, the discourse on the approach to mass food production and the effect on the nutritional quality of livestock was very effective. I never really thought about the effect, for example, of forcing animals to eat foods (corn primarily) that they naturally can’t without getting sick just because it pushes the ‘right’ metric. At times Pollan heads toward a bleeding-hearted sappiness that undermines otherwise very interesting observations. In many of these times he saves himself by admitting as much. Even with these moments, I walked away from this book completely impressed by his writing and findings. August 25, 2007 I finished the book today and am giving it the 4 star rating above. I really liked how each chapter explained a particular myth and explored the causes of it. In some chapters, there was more practical advice for dealing with the myth, while in others you are sort of left to just understand that it is there which I suppose is helpful in its own right. One of the ideas that stuck out to me was the idea of the goodness/adoption paradox. The premise explains partially why it is that the best ideas don’t always win (one of the myths). On the one hand you have increasingly good ideas, but these tend to go hand in hand with decreased ease of adoption. At some point, you have a sweet spot that represents neither the best idea nor the easiest to adopt idea. But it is the one that tends to win out. August 16, 2007 I am currently reading The Myths of Innovation , by Scott Berkun. This is a relatively short book, but the content is thought provoking so far. In some ways, a few of the concepts in the book remind me of some of the concepts in Fooled by Randomness . Both books discuss some of the weakness humans have in judging certain situations. Fooled by Randomness talks a lot about our weakness in assessing risk. In this book,we learn that we have a hard time interpreting innovative history for numerous reasons. I could talk a bit more about that here, but I think Scott does a better job than I would and I don’t want to spoil it for you if you read it. After reading The Devil in the White City, I thought that I would read another book by Erik Larson that sounded like it had similar qualities. Thunderstruck is the two stories of Marconi and his quest to deliver wireless communication with a murder mystery that ultimately is foiled in part because of Marconi’s invention. While the history is interesting, in particular on the Marconi side, it doesn’t quite mesh as well as Devil in the White City. In comparison, this book almost seems forced. That said, I did learn some interesting history. It is particularly fascinating to really think about concepts like wireless communication from the perspective of it never previously existing. We take it for granted now, but like electricity, few of us really understand how it works. When we pause to think about it, it is still quite magical. For me, this is where the book really shines. The Devil in the White City, by Erik Larson tells the parallel tales of Chicago winning and developing the site for the 1893 World’s Fair and the tale of a serial murder who utilized the fair as a tool to lure his victims. On the one hand we have Daniel Burnham struggling to make his legacy through the fair. On the other, we have H. H. Holmes cementing his legacy as ‘The Devil in the White City’. The individual story lines could be classified as remarkable pieces of history that would be interesting on their own. The comments I have heard from others who have read this book are usually along the lines of disbelief that this is not fiction and/or the disbelief that they didn’t know about this before. I am in total agreement. Copyright © 2019 Ryan Jacobs. All Rights Reserved. The Gridiculous Theme by bavotasan.com.